Some kids are picky eaters and unfortunately my kids belongs to that category. My elder kid, she made me to cook creatively as she always need something very attractive in her every meals. Kids tiffin / lunch box will be a great headache for most of the moms of picky eaters. Me too suffers such a situation most of the time. Here it is. A scrumptious fruit and nutela sandwich. Sandwiches - a great blessing in my opinion. Tea sandwiches / Finger sandwiches made from ingredients already in our house were really the only solution for working moms. 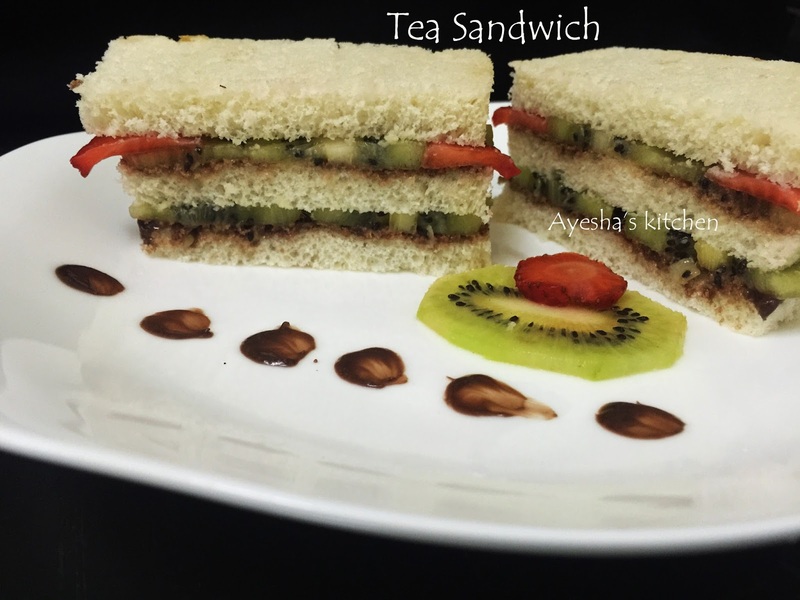 Finger sandwiches are also a pleasing day time snack which can be made with fruits (sweet sandwiches) and with veggies or meat. So here is the recipe for a sweet easy snacks recipes with bread and fruits. 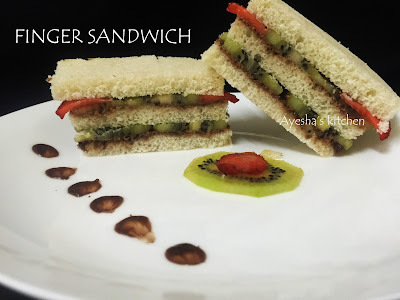 Lets see how to make tasty, yummy and kids favorite three layered finger sandwich with kiwi, strawberry, chocolate cream / nutela and bread. Enjoy !!! Remove the side of the bread with a sharp knife. Here am going to prepare three layered sandwich. Take a bread. Apply some nutela or chocolate cream evenly over it. Now layer it with kiwi and strawberry slices. Again apply nutella on another bread and layer it over the fruit topped bread slice. Continue topping it with kiwi and strawberry slices. Finally cover it with another bread slice. Press gently. Cut into two pieces vertically. Yummy finger sandwich with fruits ready.